MultiBank was established in California, USA in 2005. Since its launch MultiBank has evolved into one of the largest financial institutions worldwide, with a current paid up capital of over US $322 million. MultiBank’s value is expected, within the next two years, to increase substantially to circa US$ 2 billion once it undertakes an IPO. 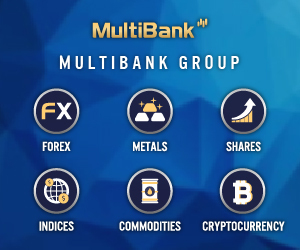 Combining prime liquidity, cutting edge technology and first class customer service, MultiBank delivers advanced trading platforms and tight pricing in online ﬁnancial products, including Foreign Exchange, Metals Stocks and CFDs to over 280,000 retail and institutional customers in more than 90 Countries. For MultiBank, 2016 was a momentous year wherein, our platforms executed trades with a notional turnover in excess of US $4.3 billion per day in Foreign Exchange and Financial derivatives trading, while catering to extensive client-base of over 280,000, stretching across 90 countries worldwide. The success of MultiBank proves that electronic exchange technology is most certainly the future and direction of the financial markets. We are proud of the fact that in terms of global Forex dealings, world-renowned Banks and major Financial Institutions worldwide are using our award winning trading technology, liquidity and brokerage services. You need to open a new account. Click here to open a new account for MEX Exchange (AU), here to open a new account for MultiBank FX International (BVI), or here to open a new account for MEX Clearing (UAE). Contact MultiBank Exchange Group at ics@mexgroup.com to have the funds transferred from your old account to the new one. For a limited time only, any new client that opens a trading account with us can claim an additional 20% of their deposit amount when they meet the basic trading requirements below.